Are you bored? It’s time for fun office games! You’ve been moseying around on the Internet for a while, and all that time, you’ve been staring at the hour, minute, and second hands of the clock on the wall across from you. “Hmmm. They appear to be permanently stuck,” you’re musing to yourself. And now you’ve stumbled upon our blog, which means you’re probably looking for fun things to do in the office when bored. Does that sound like you? Look no further! Here’s our list of the top ten most creative Internet activities – keep scrolling down to find out some fun office games when stuck at work, and we guarantee you that the time will fly by. Actually, you don’t even need to consider yourself a gamer to be a fan of this one. Pac-Man (or Pacman) is one of the fun office games you have to try. It was first released in Japan in 1980. It was an instant classic. The now-famous icon was inspired by the image of a pizza pie with one slice missing – in addition to the simplification for the Japanese kanji character for “mouth.” Today, its lasting effect on pop culture can be found everywhere – clothing, art, movies, and other video games. It was originally designed for the realm of arcade games and can still be found there, but luckily for us, it’s also available for free online. Its popularity doesn’t seem like it will ever fade. The site also features new versions of the game like Anti-Pacman, Mario Pacman, and Ms. Pacman. Wasting away at your desk job when you’re an artist at heart? This is one of the best fun office games. Tap into that creative, right-brain side of your personality on skribbl.io, a simple drawing and guessing game. It’s pretty self-explanatory –enter a nickname and hit “Play,” and you’ll be brought immediately into a game with other players. One person draws, and the others type in their guesses into a chat window on the right. When it’s your turn to draw, you choose one of three words offered and get to drawing! You gain points for guessing the correct word, and the quicker you are to guess the right answer, the more points you get. Whoever has the highest score at the end of the game wins. To keep track, keep an eye on the other players on the left-hand side of the screen. 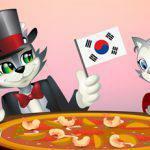 Their nicknames are displayed along with silly avatars as well as their current scores. There’s also the helpful option to “Votekick” the current artist if the player is not responding or respecting the rules. Bonus Feature: At the top, there’s a Hangman style space with lines for each letter of the word. As time passes, the game adds letters as hints. For example, if the word was “spins,” the hint might read: “_ P _ N _.” And don’t forget, it’s free and easy to play! Speaking of free and easy to play… let’s move on to an easy one. 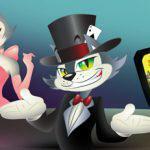 Don’t forget about us, here at CoolCat Casino we offer ! Rediscover our personal selection of ways to have fun at work. Out of our 220 games, more than 140 are slot machines. We also have blackjack, different video poker tournaments, roulette, roulette, keno, and more – take your pick! We also update regularly with new games, so don’t forget to check back. Visit the CoolCat mobile casino to play on the go, on your commute to work or way home, at your lunch break or on a smaller screen at your desk so the boss doesn’t notice! We strive to offer you only the best: the best selection of games, the best service, the best rewards, the best bang for your buck, you name it. We’re not just defined by all of the games we have, but, just as real-life casinos do, we genuinely care about your overall experience when you visit. That’s why we offer 24/7 customer support. Our games are all available through our mobile app, so that you can play at your own convenience. 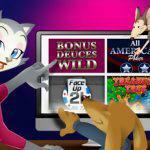 Bonus Feature: Our CoolCat Casino Bonus Codes page offers free spins and discounts for various games. Be sure to check out the amazing deals we offer to keep you playing for longer. Are you looking for an activity that doesn’t feel like a complete waste of time? Here’s the perfect solution: FreeRice.com is an ad-supported website that features an easy, multiple-choice vocabulary “quiz.” The site was established in October of 2007 by computer programmer John Breen. On the day that it opened, 830 grains of rice were donated and billions of grains of rice have been contributed since. All you need to do is click on the correct answer, and the next screen displays whether you got it right or not. The next question appears automatically, and on the right, there is the image of a wooden bowl with the motivating rice count updated with each correct answer: “You have now donated 160 grains of rice.” The wooden bowl even fills up with rice as you continue to play! It’s the ultimate win-win situation! If you’re not so confident about your vocabulary, don’t worry. There are no downsides, so just take your best guess. If you’re wrong, you’ll get a notification (“Incorrect! fortunate = lucky”) along with the next question. No keeping score and starting all over again if you “lose,” plus you have the benefit of learning a new word! Bonus Feature: the site now also includes new subject matter, like painting, chemical symbols, world capitals, and foreign languages. Not only is it an engaging challenge, but if you like to gamble, it’s also beneficial for your mental flexibility. It helps you think on your feet, which in turn will increase your confidence. After a training session, get back to Activity #3 – take a spin on CoolCat Casino to flex those cerebral muscles and test out that mental agility! Bonus Feature: If you find the program engaging and effective, upgrading your Lumosity account is easy. A Premium membership unlocks customized workouts, unlimited access to the game library, and personalized reports on your game play and progress. Why not do something productive and learn a new language? Duolingo is a free platform that has gamified learning new languages. It starts with a proficiency assessment to determine how advanced the course should begin, so don’t worry about whether you’re beginner or intermediate. The course itself will take care of this part for you. Our favorite thing about Duolingo is how easy it is to keep up your interest. If you’ve ever taken a foreign language class in school or attempted an online course, you probably know how quickly dry material can demotivate even the most enthusiastic learner. Duolingo uses a “skill tree” that helps you track your own progress and keeps you invested. It incorporates text, images, and audio recordings to help you learn in a way that accesses different learning styles. The idea is to associate the sounds and visuals so that the foreign language isn’t simply printed words on a page. They also include the task of translating the audio back into English to help reinforce new vocabulary. As you complete different sections, the tasks get harder. If you’re not a complete beginner, you are able to complete exercises in several sections at once, and in this case, Duolingo also adapts the difficulty according to your performance. We recommend downloading the app to give yourself more chances to practice. Bonus Feature: As of November 2016, they offer 23 different languages in 68 courses. If you feel proficient in one, you can continue exploring other options. This website is home to over 35,000 different games (as of November 2016). You won’t even find yourself fantasizing about a nap after lunchtime because you’ll be excited to search for a new quiz to try. With a total of fifteen categories (Sports, Geography, Movies, and Religion, just to name a few), everyone is guaranteed to find something – basically, if you’re even remotely interested in anything at all, there will be something for you. You can also create a Sporcle account to join the community, participate in spirited discussions, and accumulate achievement badges. Bonus Feature: Sporcle Live consists of live pub trivia games hosted in bars and restaurants. Teams can play for gift cards or join the Pub Champions Trivia League for a chance to win larger prizes. If you get lucky with cash prizes, make another visit to our slots games for some extra action. Does your Monday morning routine (or daily morning routine) revolve around an intense jam session in front of a foggy, post-shower bathroom mirror, with an invisible mic in your hand? Check out Incredibox, a truly incredible source of endless entertainment. It allows you to mix beats and tunes in what becomes a hypnotic and unique medley. Different characters pop up on the screen, and there is a set of drag-and-drop symbols (instruments, percussion, effects, chorus, etc.) that make different sounds effects. Regardless of your skill level, Incredibox manages to make everything sound good. You’ll feel like a pro, no matter what. And now, with four versions to choose from: The original, Little miss, Sunrise, and The love, Incredibox is highly personalized. You can spend hours upon hours and still come up with creative new combinations. If you’re ever stuck and looking for inspiration, many user creations are even available to view on YouTube. Some have hundreds of thousands of views – who knows, maybe you could be the next Incredibox YouTube celebrity! 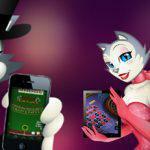 Bonus Feature: In 2016, the game was released as iPad and iPhone apps, which means you can drop beats wherever you go, whenever that creative urge strikes you, like in-between spins at the CoolCat mobile casino! 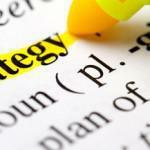 Racking your brains for unconventional things to do in the office when you are bored? Here’s one idea you probably haven’t thought of yet: mitsuku.com. As far as fun office games are concerned, Mitsuku doesn’t quite fit the category – there are no right or wrong answers, rules to play by, or ways to keep score or win, but “she” has a bubbly demeanor and her company is reward enough! Mitsuku is the Internet’s most intelligent AI chatterbot – she is the current recipient of the Loebner Prize for the most human-like chatbot. Before you start using the webpage, a disclaimer pops up. It begins with the description: “Mitsuku learns the behavior and language of the people who talk to her,” and continues with a warning: “Remember, if you are mean to her, she will be mean to you.” However, if treated well, she can be a companion, a confidante – even a coach! Unlike many other forms of AI that are developed for specific purposes, Mitsuku’s primary function is simply to hold conversation – about anything. Mitsuku can even play games, tell jokes, and do magic tricks at the user’s request, and she gets smarter as you chat. When asked “What is your most impressive ability?” she replied, “I think just being able to hold a conversation like a real person is pretty impressive.” What we like most about her is that she offers a mix of different activities, for example: 20 Questions and Hangman. But the games we like best are 5 card poker, blackjack, and… lucky slots! You start with 50 coins and each spin costs you one coin. The game ends when you’re out of coins or if you make it to 250 coins. 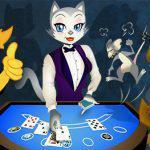 Once you’ve warmed up, head over to CoolCat Online Casino fun office games for a huge selection of real money slots, video poker and blackjack 21 games! Bonus Feature: Mitsuku.com also includes a Turing Test, so you can have a conversation, then guess whether it was with a person or a computer. Plan your next holiday! Daydreaming at work inevitably leads to wishing you were somewhere else. Why not use this time to get yourself one step closer to actually being somewhere else like Las Vegas, Atlantic City or Macau? Adventure awaits! Jetsetter compares itself to “your most well-traveled friend, the one with great taste and inside connections, who you call when you need advice on where to go, where to stay, and what to do when you get there.” Basically, it has access to information and deals that would take you a lot of time and energy to find, curating the best results to save you time. They’ll even provide information regarding details that you didn’t even realize you cared about, like the strength of the water pressure or comfort of beds at hotels. If you’re looking for luxury vacations, why not do a little extra research – sure, you might want to hit the beach or light candles at some churches, but consider a trip to Vegas or Atlantic City, where you can gamble in real life (and, as always while you travel, on your phone with the CoolCat mobile casino). Bonus Feature: Jetsetter.com features its own magazine. If you’re not sure where to start, then articles like “The 9 Best Places to Travel This May” and “8 Best Boutique Hotels in Ibiza for Wellness” will get you moving in no time. Well, there you have it. 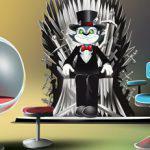 Bookmark this article along with CoolCat Casino instant play as your go-to cures for office boredom. Next time you ask yourself what to do in the office when you are bored, you’ll have a full quiver of ways to while away the time! You might even find yourself looking forward to the next time you’re bored out of your mind!